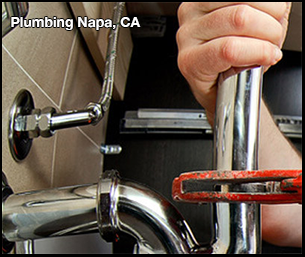 Plumbing Napa, CA | A+ Waterworks, Inc. Since you make use of your plumbing in Napa, CA every day—it’s only right that you invest in its regular maintenance. People tend to pay attention to their plumbing in Napa, CA only when they have issues with it. However, you shouldn’t be ignoring your plumbing in Napa, CA just because you aren’t experiencing any overt problems with your faucets or water heaters. You should get regular maintenance of your plumbing in Napa, CA. For this, you should turn to A+ Waterworks. We are a full-service plumbing company that is dedicated to providing you with all the quality service that you need. With us, you can be sure that your plumbing in Napa, California will work smoothly. Having dependable plumbing in Napa, California is vital to everyday life. Plumbing disasters can ruin your whole day and lead to further issues, such as property damage and high water bills. Without well-maintained plumbing in Napa, CA, you’ll have difficulty washing, cooking, and drinking, among others. When you get regular maintenance for your plumbing in Napa, CA, your fixtures will work better and more efficiently. Proper upkeep of your plumbing in Napa, CA ensures that your kitchen and bathroom functions as it should. It also lessens the need for emergency repairs in the future. The pipes that comprise your plumbing in Napa, California need to be replaced someday. However, that day may come sooner than you expect. Rust and continuous pressure can weaken your pipes without you knowing until it is too late. Catch these problems early and prolong the lifespan of your plumbing in Napa, CA. Have your plumbing system regularly maintained by our expert team. Issues within the complex system of your plumbing in Napa, CA can cause direct water leaks. These leaks can bring about mildew and mold in your home or office building, both of which contribute to poor air quality and health problems. If you regularly work with a company that specializes in plumbing for Napa, CA buildings, you’ll be able to avoid having these substances affect the people in your home or office. Let’s face it—fixing issues with your plumbing in Napa, CA is expensive. An emergency plumbing disaster may involve large quantities of wasted water, buying replacement parts, and hiring the services of experts. All of these can cost you a pretty penny. Don’t wait for emergencies to arise before you take care of your plumbing. Napa, CA residents who want to ensure the health of their plumbing systems can look to A+ Waterworks for exceptional and timely service. Since 1994, our family-owned-and-operated business has been providing quality plumbing, sanitation, and fire system installation services. Whether you have emergency issues with your plumbing in Napa, California or you just need regular upkeep for your pipes and water fixtures, you can turn to our local team and we will handle it. Get in touch with us today for a free estimate. You can give us a call at 707-255-5270, send us an e-mail at [email protected], or even drop by our office at 194 Camino Oruga, Ste. 13, Napa, CA 94558. We’re open on weekdays from 8:30 AM to 5:00 PM. The A+ Waterworks team has decades of industry experience in local homes and commercial sewer cleaning. Our sanitation experts will do everything to determine the cause of the blockages. From there, we’ll use the information we get to plan and implement actions that prevent these blocks from happening again. After learning about the importance of our services, it’s time to get in touch! We serve all clients in North Bay, CA.